Recently, I have been thinking a lot about my childhood, and the things that were and are dear to me. One of the things that my mom did that I loved was read to us. When i was really little it was always in the rocking chair at the end of the upstairs hallway. She would rock and read and I loved it. As we got older we would all lay on her bed just before bedtime and she would read to both Matt and I. So, I have begun the tradition with my boys. I know that they can't understand the story and wont for years to come, but it makes me feel very connected to them. I would like to read some of the same books that my mom read to us. I've started with Hinds' Feet on High Places. It is the story of a young shepherdess named Much-Afraid. She is lame and severely blemished and wants to be beautiful. It is the story of her journey to the High Places with the Shepherd, how she enters the Kingdom of love with the blossom of love in her heart that bloomed throughout her journey. 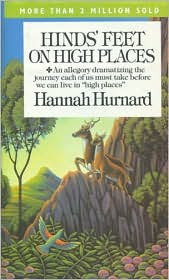 Her lame and crippled feet become like hinds' feet, able to leap upon the High Places with ease. I've been reading out loud to them most mornings. I like to think that they really enjoy it. Next book will be James and the Giant Peach, which was one of my favorites. I was wondering if any of you had favorites growing up, any suggestions, or must reads? Awwww, Hinds Feet is one of my all time favorites. What a sweet Mama you are. My mom used to read us short stories from the Book Of Virtues. There's one called Grandma's Table (I think)... makes me cry every time! What a great idea. I loved "The Velveteen Rabbit". I love you! I don't remember childhood- ha! But I do remember that I loved Hinds Feet on High Places. The boys and I have loved Mr Putter and Tabby books, Nate the Great and Good Night Moon! congratualations on the approaching birth of your twins!